Well, there’s ALWAYS something going on at Cat Scouts. 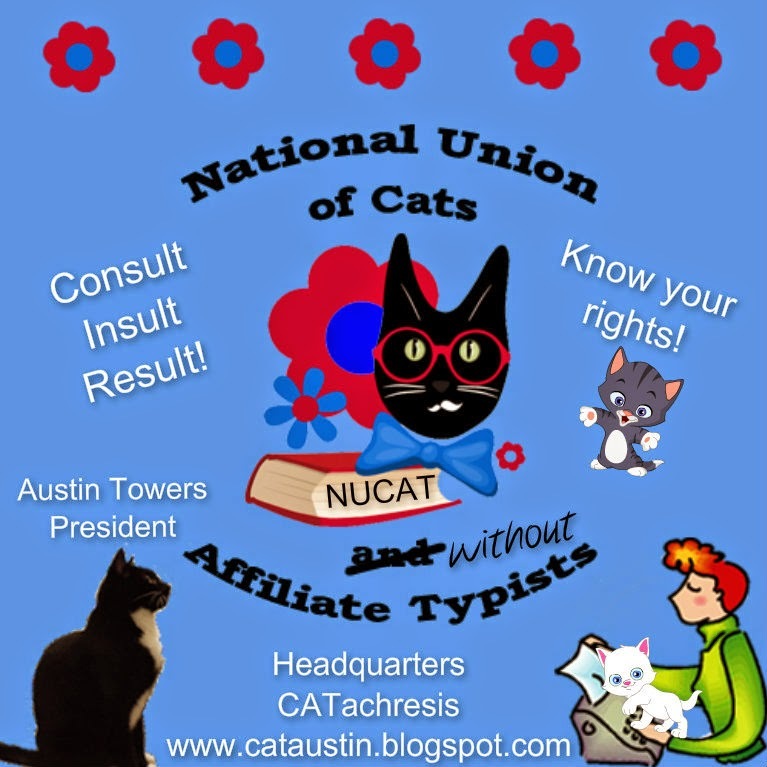 ALWAYS……….recently we started a “FLAT CATS” travel group – we all had pictures of ourselves enlarged and mounted on cardboard or poster board and we’re currently mailing ourselves all over the place to visit each other! I know FLAT CATS have been around a while at a lot of the conferences but we thought we’d give it a whirl and it’s turning into a real TRAVEL FRENZY! So far I’ve visited Spencerville and Indianapolis, Indiana, and I’m about to fly down to Florida then back up to North Carolina. WOW. Who knew a FLAT CAT could have so much fun??? Yesterday Mr. Mailman delivered TWO big envelopes here – one had my buddy from Scouts Sammy Pilch in it (or “SammyP” as he’s known at Scouts) and the other had my besties Raz, Allie, Anya and Gracie in it. 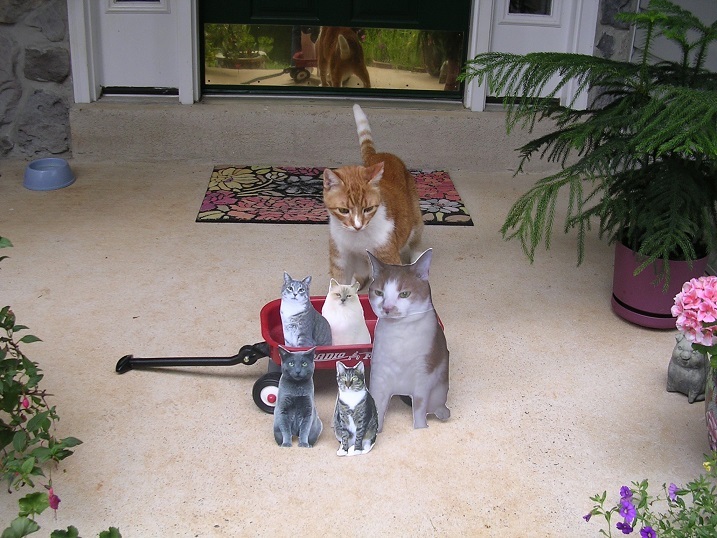 Today I showed them my red wagon and took them for a ride around my yard in it! My other Scout buddy, Raz’s girlfriend Madi, is still here but she’d been outside before with me here and decided to stay inside and have a snack instead of another yard tour! Here are some photos from my trip to Indiana! And here’s Madi when she arrived – having a snooze her first night here in the guest room AND the next day when we had a picnic on my front porch! 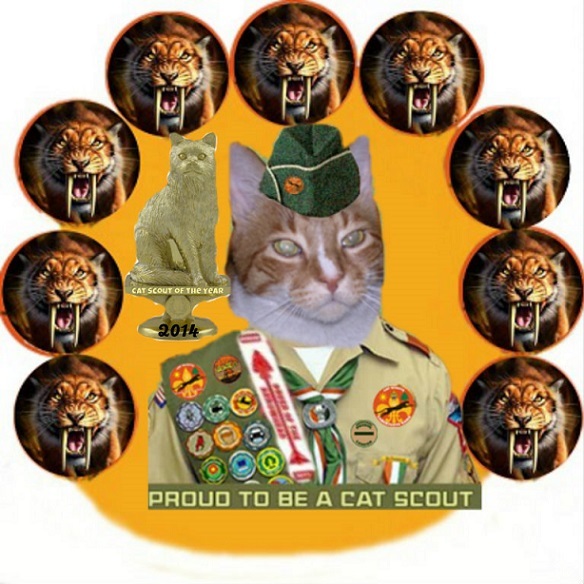 If you’re a cat and want to have a TON of fun – consider Cat Scouts!! If you join up, you might like to join MY Troop, the Worldwide Wildcats. That’s right – I’m the TROOP LEADER!!!! Know what tomorrow is? HMMMMM??? That’s right – it’s MONSTER DAY! Geez, if I want to visit, I have to do it in person (catson?)! What fun and none of the travel sickness! These are good travel adventures, S. I didn’t realize you are old enough to drink…. 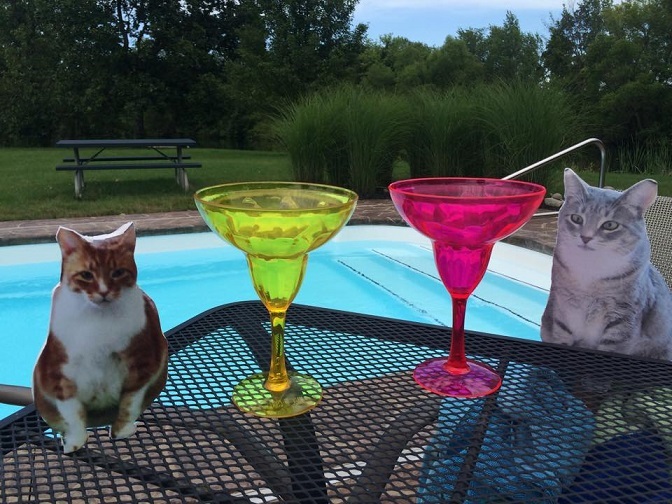 HAHAHA……niptinis are nice and refreshing around the pool!! What a neat idea, Sammy! 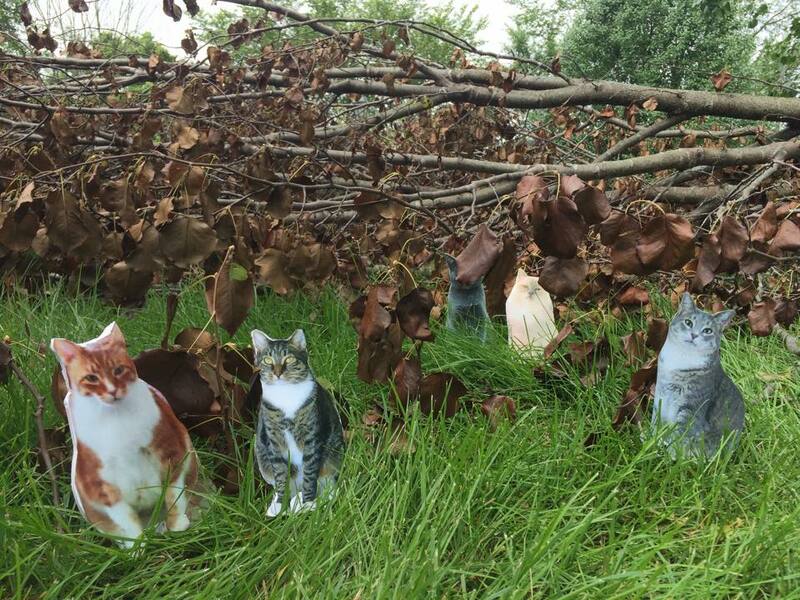 Clever way to spend time with your furriends! Sammy….you have quite a house full of guests. When things quiet down I’d love to come and visit. Charles you are welcome ANY TIME at all…………..I’ll never be too busy to see you here! Trust me! Mom is emailing your Mom with our home address! SAMMY YOU HAVE A PACKED HOUSE!! YOU AND RAZ ARE BRAVE TO ‘TRY’ TO KEEP UP WITH ALL THE LADIES! Oh I’m having the time of my life – trust me on that! Our Flat selves are having a blast! We loved your red wagon!!! Sammy P had a great time and it looks like everyone else did too. We can’t wait for you to visit us Sammy and for visits from the other Scouts too! As soon as I get back from Raz’s I’ll come visit you I promise! I’m glad you’re enjoying your little getaway SammyP !! Uhoh….forgot Anya – Gracie’s Mom is visiting family in Indy so maybe she won’t notice! I saw on Scouts I think that Mau has his flat now? Time to TRAVEL! Sounds like a lot of fun. Have a great day! That is such a fun idea and you sure have been getting around Sammy! YEP – slip ’em in an envelope and they can go ANYWHERE!! Oh it’s tons of fun Hou Hou – TONS! Hi Hou Hou! We’re having tons of fun…….who knew being FLAT could be fun?! 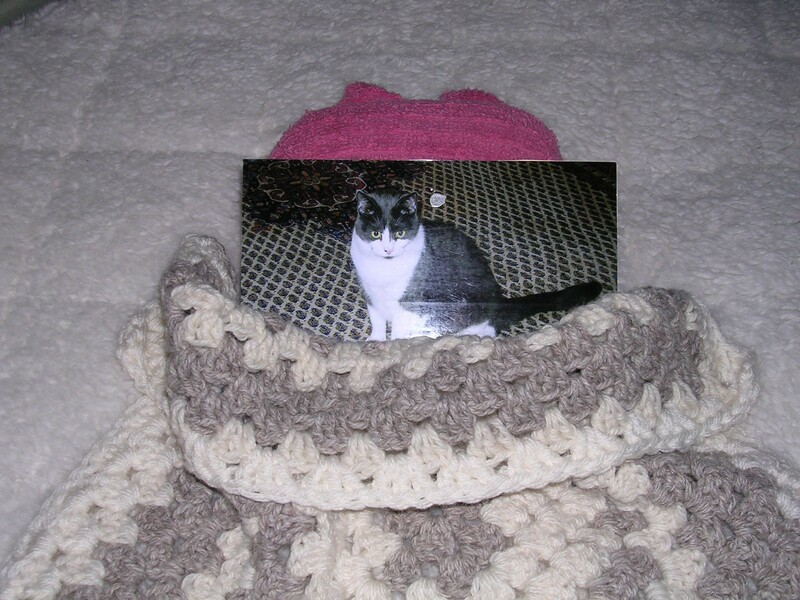 They were fun to make……….just a photo enlargement then mount on poster board and voila – A FLAT SAMMY! Those flat cats are having lots of fun! You got run over by a steamroller? It sure changed the amount of food I eat I can tell ya……………FLAT IS BEAUTIFUL! 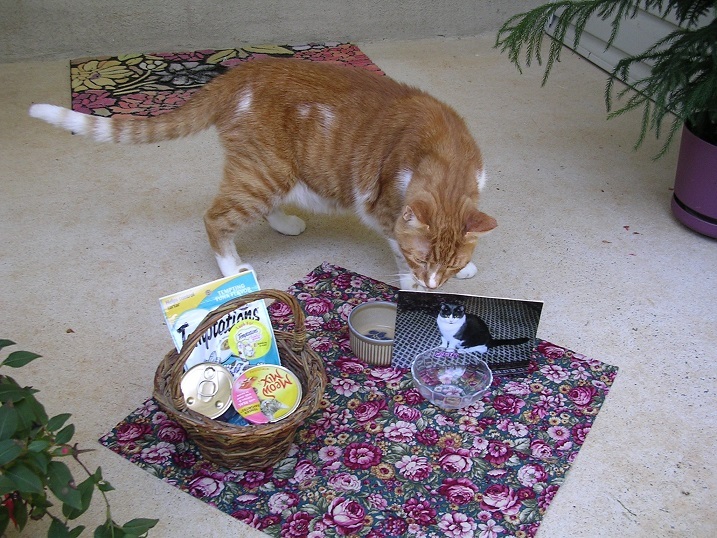 OH those flats cats look like such fun and what a fabulous visit! It is fun – There must be a whole lot more mail being passed around thanks to this! HAHAHAHA Also there are Cat Scouts out of the country so that makes it even MORE fun! This is such a great idea. 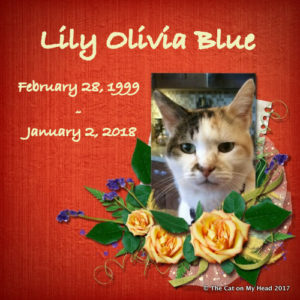 I’d like to see pics of the cats visiting local sites, favorite places in their town. Some Scouts are doing that – taking the Scouts to different places outside the home but I have to admit (!!) it’s easier to just do things around the house or yard!!! HAHAHAHAHA One thing for sure though – it’s a TON of fun and we can’t believe how many FLAT SCOUTS are traveling! The Denmaster is making a contest out of it – whoever travels the most miles between when we started (about 3 weeks ago) and Thanksgiving will win a prize (which we haven’t been told what it is)……………….that should be fun. Oh Nellie!!!!! We do have a lot of fun at Scouts but your Mommy is SOOOOOO busy I know she doesn’t have time to pawticipate. You sure would look gorgeous in the uniform though! 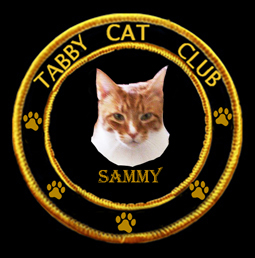 Mee-you Unccle Sammy sounds like a lot of hard werk mew mew mew…. I know – you have your Flat Phoebe right where you want her! By your side! Mew mew mew that’s so true Unccle Sammy!!! Wow Sammy yous all loook like yous havin’ a good time. Can’t wait fur y’all to come and visit here. As fur monster day…wow wasn’t it just monster day? 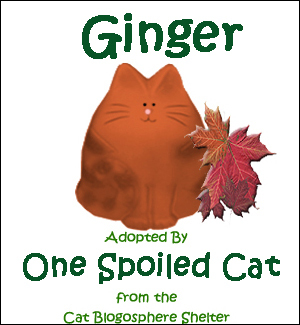 MOL Have a gweat day. Hi Ladies! I will come visit you when I get back from Florida!!!! What fun it is traveling……!! 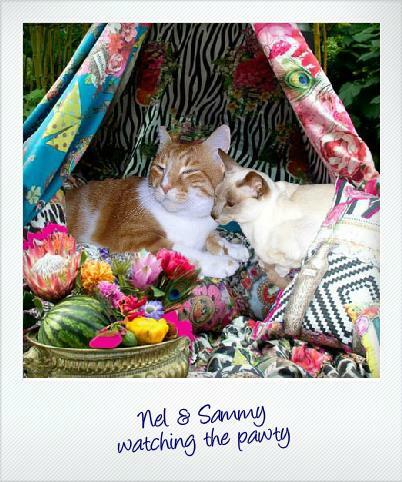 Oh Pawsum Sammy, we can’t wait. 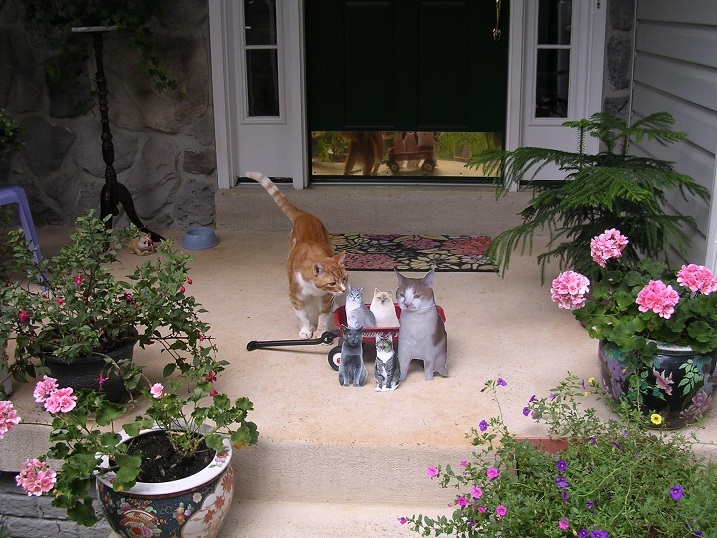 You are having so much fun visiting with all your Flat Cat friends! I bey everyone enjoyed the ride in your red wagon. I was happy to show off my red wagon with my FLAT friends! Today I’m leaving with them to head to Florida – it’s nice to have a vacation even if it’s just FLAT me going! What fun you’re having, Flat Sammy! The mom is too lazy, and so uncreative, to make me a Flat Wally. Oh Wally I think your Mom is probably a very busy lady! I will tell you though that some Scouts are just using a photo of themselves and sending THAT around to visit so that’s a possibility for you too!! Wow, you all could have a party! Lots of flat cats visiting. Good to hear it. Isn’t the monster day early this week? Mom and dad did there cleaning today too. I’ve got a LOT of visitors but everyone (including my FLAT ME) are heading to Florida today or tomorrow!!!!! WOOT!!! The monster is coming TODAY……..I’m prepared! 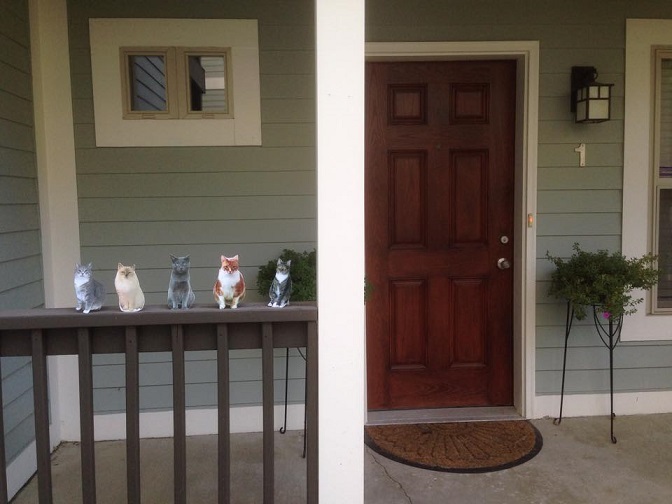 YES the front door is wooden and poor Dad has to repaint every few years and replace the brass fittings…….most of the other houses in our development have replaced their front doors with something more decorative but Mom and Dad think this one works just fine! Is your door metal? NEW HOUSE????? Still thinking about the 55+ place? 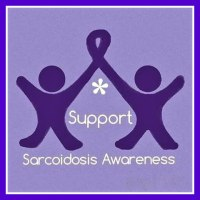 Mom says please send a link to the 55+ place so she can see it! I bet you will miss the Tiny Ten but know what? Anyplace you hang your hat (or boots!) is home! Sammy, I really, really hope that you have put me on the list of places to visit. I can hardly wait for you to come to my house. My mom hasn’t done flat Andy yet and I am getting impatient with her. Oh I’m sorry Andy – remember though that you can just use a photo of yourself because Scout Madi is visiting us now and she’s just a photo!!!! It would be EASY PEASY for your Mom to have a photo enlarged of you and then just mount it to cardboard. EASY! 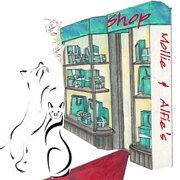 Anyway, I’d love to visit you – when I get back from Florida I’ll let you know!